I'm slowly restocking my Etsy shop. When I get really busy with graphic design work, I'm afraid it lies sad and neglected. Meanwhile, the lovely items sewn by my mum pile up. And as always, if you want to buy some of my fabric and make happy things yourself, it's available all over the internet, including at JCaroline Creative, which carries the most complete collection of my prints, as far as I know. You have read this article fabric / shop with the title September 2009. 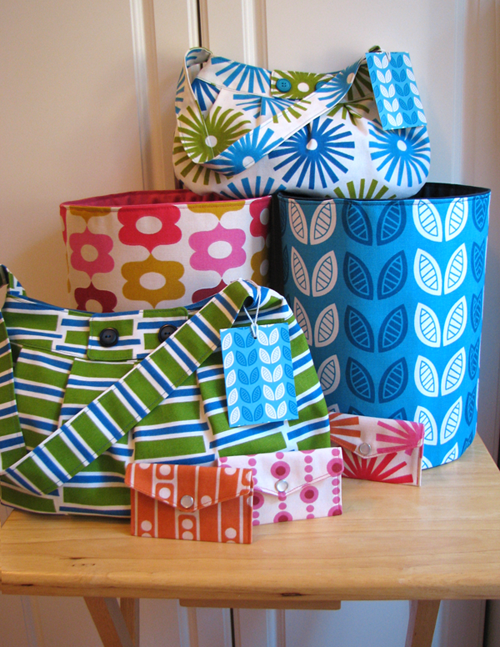 You can bookmark this page URL http://jenkrebs.blogspot.com/2009/09/restocking-shop.html. Thanks! 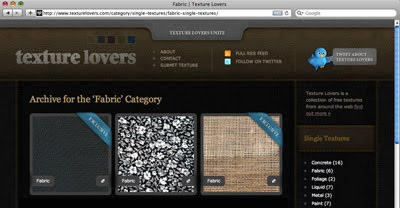 If you need texture photos but have no budget, check out Texture Lovers. The site's photographs are "free to use in commercial and personal work" with no attribution required. Find pictures of fabric, metal, paint, wood, and more. You have read this article downloads / graphic design / resources with the title September 2009. You can bookmark this page URL http://jenkrebs.blogspot.com/2009/09/free-texture-images.html. Thanks! Welcome to our dining room. 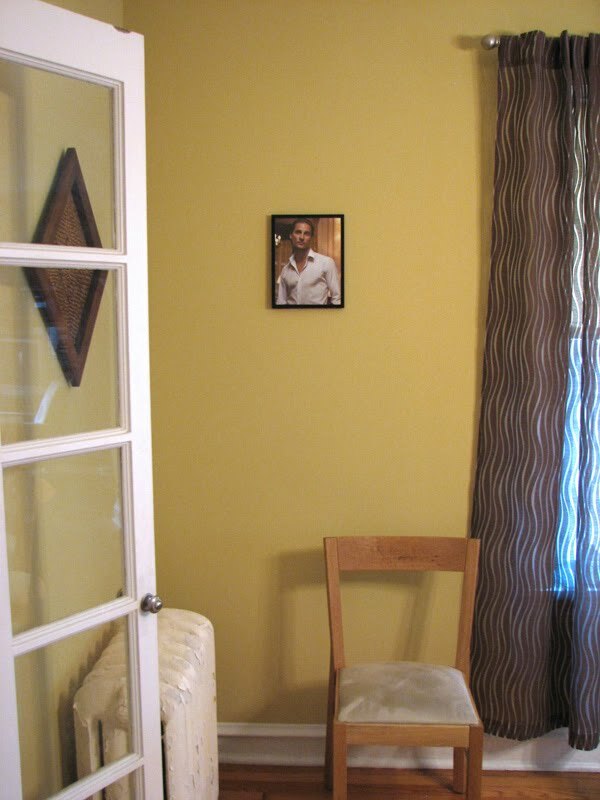 While flipping through a magazine the other day, Alex paused on a full-page photo of Matthew McConaughey, snickered, and joked that we ought to hang it on the wall. Hmmm, guess what happened while Alex was out one day. We don't have any particular liking for or aversion to Matthew M. But whenever we look at that manly pose, we can't help giggling. (Click to admire larger.) It seems to produce the same effect in anyone else who comes to visit. 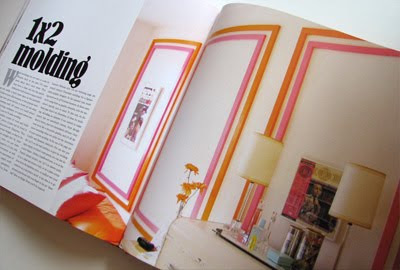 You have read this article decorating / home / random with the title September 2009. You can bookmark this page URL http://jenkrebs.blogspot.com/2009/09/hey-matt-what-up.html. Thanks! A review copy of Wary Meyers’ Tossed & Found arrived in my mailbox this week. After thirty seconds of thumbing through it, I was ready to drop everything, hop in my car, and start driving down alleys looking for abandoned junk. 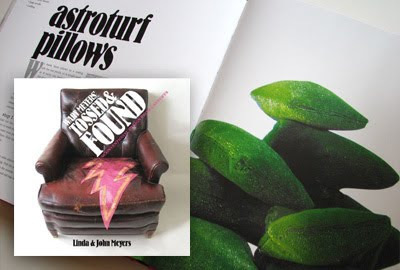 Authors John and Linda Meyers rescue unwanted stuff and transform it into one-of-a-kind items for homes; the book shows off their projects with instructions. It's completely inspirational. And it makes me feel a little sorry for myself because I don't have a workroom or a garage. Using power tools in my living room doesn't quite work, and I'm not lugging a stack of old barn siding up three flights of stairs. But no matter. I have renewed determined to find something and fix it up. I'll keep you posted. You have read this article books with the title September 2009. You can bookmark this page URL http://jenkrebs.blogspot.com/2009/09/tossed-and-found.html. Thanks! Ready for more stunning work? 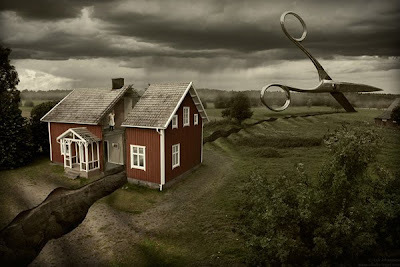 Erik Johansson is a Swedish photographer whose retouching skills put my jaw on the floor. Most clients ask me to change the wood finish on a product from cherry to oak, or smooth down some stray hairs in a headshot. It's like performing a card trick at a kid's birthday party, while Erik makes the Statue of Liberty disappear. 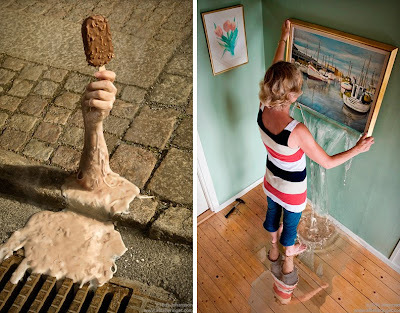 See more of his work right here. You have read this article art with the title September 2009. You can bookmark this page URL http://jenkrebs.blogspot.com/2009/09/magical-photo-retouching.html. Thanks! While happily browsing at Happy Mundane, I bumped into Cheeming Boey's work. 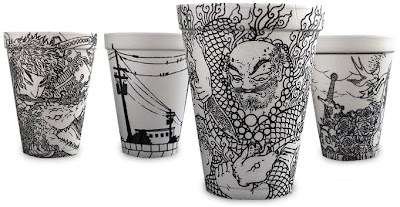 Boey lives in California and draws on foam cups with Sharpies. And we're not talking stick figures. Waves, birds, vines, Japanese motifs. I contacted him to get permission to post some photos and asked if he had anything to say about his cups. He replied, "I would like to show people that canvases can be anything... just because it says disposable doesn't mean it has to be." Right on. To see more cups, click here. Read interesting articles about Boey here and here. You have read this article art with the title September 2009. You can bookmark this page URL http://jenkrebs.blogspot.com/2009/09/styrofoam-cup-art.html. Thanks! You have read this article cards / downloads / printable with the title September 2009. You can bookmark this page URL http://jenkrebs.blogspot.com/2009/09/printable-thank-you-card.html. Thanks! You have read this article paper / recycled / sewing / tutorials with the title September 2009. 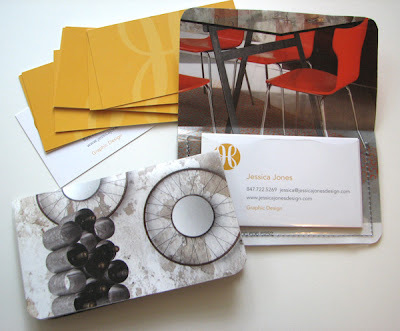 You can bookmark this page URL http://jenkrebs.blogspot.com/2009/09/recycled-magazine-business-card-holders.html. Thanks! You have read this article art / desktops / downloads with the title September 2009. You can bookmark this page URL http://jenkrebs.blogspot.com/2009/09/lena-corwin-desktop-wallpaper.html. Thanks! 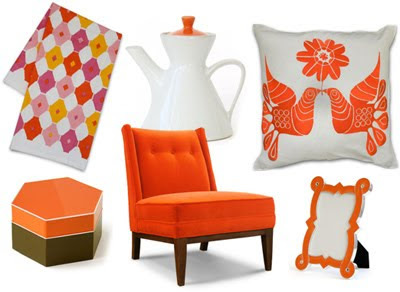 Check out the treasure trove of orangey goodness over at Jonathan Adler! Alas, my budget is about the size of one napkin ring, but a girl can dream. 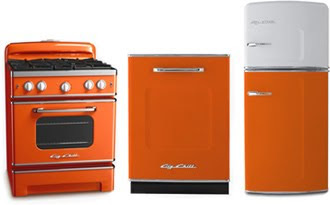 And for my imaginary kitchen, perhaps an orange appliance from Big Chill. You have read this article decorating / shop with the title September 2009. You can bookmark this page URL http://jenkrebs.blogspot.com/2009/09/decorate-with-orange.html. Thanks! You have read this article fonts / games / time-wasters with the title September 2009. 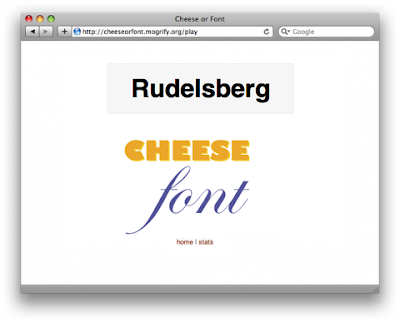 You can bookmark this page URL http://jenkrebs.blogspot.com/2009/09/quiz-is-it-cheese-or-font.html. Thanks! 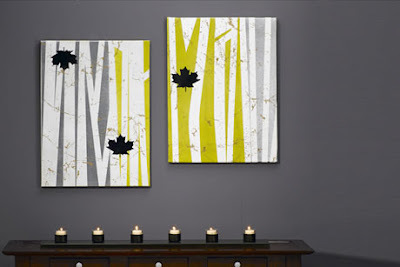 You have read this article decorating / tutorials with the title September 2009. 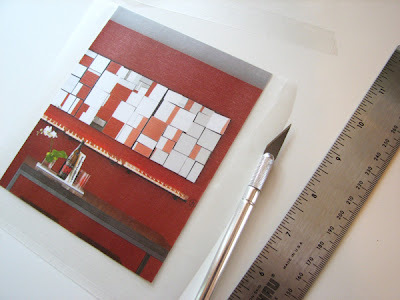 You can bookmark this page URL http://jenkrebs.blogspot.com/2009/09/projects-for-weekend.html. Thanks! I was delighted to see this felt pillow tutorial on Etsy's blog. Orange plus felt rosettes? What's not to love? And very trendy, since fabric flowers and ruffles seem to be springing up everywhere these days. 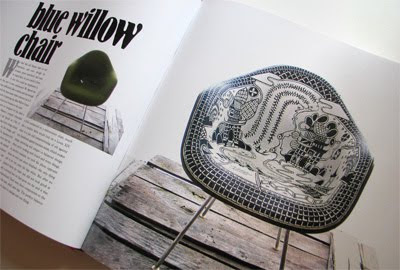 The tutorial is from Anne Kyrrö Quinn's new book, Felt Furnishings . 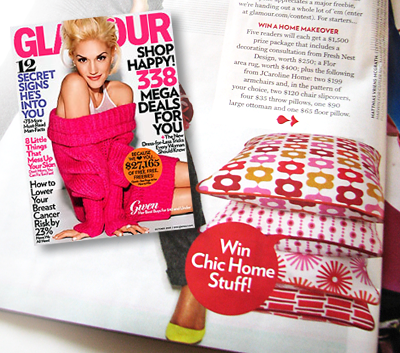 You have read this article decorating / fabric / felt / pillows / tutorials with the title September 2009. 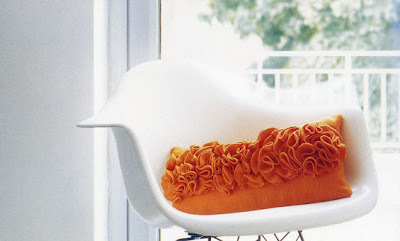 You can bookmark this page URL http://jenkrebs.blogspot.com/2009/09/how-to-make-ruffled-felt-pillow.html. Thanks! You have read this article giveaway / press with the title September 2009. 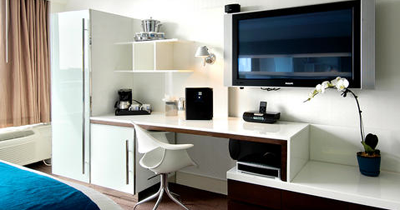 You can bookmark this page URL http://jenkrebs.blogspot.com/2009/09/win-room-makeover.html. Thanks! You have read this article travel with the title September 2009. You can bookmark this page URL http://jenkrebs.blogspot.com/2009/09/new-york-vacation.html. Thanks!